H.R.511 gains momentum as members of the House Committee on Education and the Workforce attend the July 22, 2015 markup session which was packed with members of the National Indian Gaming Association in Washington, D.C., for a legislative summit. 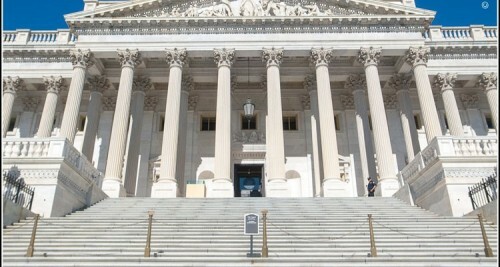 The Act which exempts tribes and their casinos from the National Labor Relations Act (NLRA), the Tribal Labor Sovereignty Act was passed on Wednesday at the short markup session on Capitol Hill. In what Rep. Todd Rokita (R-Indiana) described as a “bipartisan, commonsense proposal that will provide legal certainty to the Native American community,” the Act would exempt tribes and their casinos from the National Labor Relations Act (NLRA), and prohibit the National Labor Relations Board from asserting jurisdiction at those businesses. Rokita also went on to state that the Act would give authority back to tribal leaders and end the National Labor Review Board’s (NLRB) overreach, and restore the standard that was in place long before the National Labor Relations Board made the misguided decision to change course. An amendment in the nature of a substitute to clarify that tribal governments are also exempt from the NLRA, was offered by Rokita. Opposition to the Sovereignty Act was voiced by the only Democrats present, Rep. Mark Pocan (D-Wisconsin), Rep. Joe Courtney (D-Connecticut) and Rep. Ruben Hinojosa (D-Texas), who accused Republicans and their allies of using tribal sovereignty as a smokescreen to attack the NLRB. Representative Pocan accused proponents of the bill, such as the U.S. Chamber of Commerce, of endorsing the bill in an attempt to help destroy the NLRB rather than support for the sovereignty of the tribes. The three also noted that most employees of tribal casinos are non-Indians and argued that the bill will degrade labor standards Indian Country. Although it hasn’t been taken up by the full Senate, on June 10th the Senate Indian Affairs Committee approved S.248, its version of the bill which is gaining traction among lawmakers from both parties. At that legislative summit which opened Tuesday on Capitol Hill (hosted by the National Indian Gaming Association (NIGA)), Sen. Heidi Heitkamp (D-North Dakota) stressed that every conversation about gaming should begin by stating that gaming is not something that the federal government authorized you to do, but a sovereign right. Exemption from the NLRA has been sought after by the tribes ever since a 2004 ruling in which the NLRB asserted jurisdiction over Indian Country for the first time in decades, but efforts to address the issue ran into serious opposition from Democrats and their labor union allies at that time. Since that 2004 ruling, tribes have won support from key Democrats by pitching the issue as one of parity with other governments, and with Republicans in control of the House and Senate, the bill has moved quickly in the 114th Congress. The bill would resolve uncertainties like the one that arose in early June when the NLRB declined to assert jurisdiction at the WinStar World Casino and Resort, a casino owned by the Chickasaw Nation of Oklahoma, citing the tribe’s treaty-protected right to self-governance. Less than a week later, the 6th Circuit Court of Appeals backed the NLRB’s jurisdiction over the Little River Casino and Resort, a casino owned by the Little River Band of Ottawa Indians in Michigan, and three weeks later, expressing serious doubts about the application of the NLRA in Indian Country, the same court rejected the treaty claims of the Saginaw Chippewa Tribe, also in Michigan. The U.S. federal law that establishes the jurisdictional framework that governs Indian gaming, the Indian Gaming Regulatory Act (IGRA), has been a source of extensive controversy and litigation since it was passed in 1988. U.S. Sen. Jerry Moran has nearly $30,000 from 12 different American Indian tribes since January in support of his re-election bid. Moran, a Hays Republican who was first elected to the U.S. Senate in 2010, received $1.43 million from January through June for his re-election campaign, according to his most recent filing with the Federal Election Commission. So far $1,000 of that has come from Kansas’ Prairie Band Potawatomi Nation. Moran has also received money from Oklahoma’s Chickasaw Nation; Louisiana’s Tunica-Biloxi Tribe; Washington State’s Puyallup Tribe of Indians, Snoqualmie Tribe and Lummi Indian Business Council; Arizona’s Gila River Indian Community; California’s Pechanga Band of Luiseno Indians, Yocha Dehe Wintun Nation and Shingle Springs Band Miwok Indians; Alabama’s Poarch Band of Creek Indians; and New York’s Seneca Nation of Indians. The donations from the various tribes add up to $29,700. The support from the tribes shouldn’t come as a surprise. Moran, a member of the Senate Committee on Indian Affairs, has championed legislation to strengthen the autonomy of tribal governments in recent years. He co-sponsored the Tribal General Welfare Exclusion Act, which broadened tax exemptions for tribes and was signed into law in 2014. He has also sponsored and pushed for the Tribal Labor Sovereignty Act, which would have exempted tribal governments from the National Labor Relations Act. “These Native American tribes are part of a diverse group of individuals and organizations who support Senator Moran – including Kansans in each of our state’s 105 counties,” Moran for Kansas spokeswoman Elizabeth Patton said in an e-mailed statement. Moran has also received money from Kansas born billionaire Phillip Anschutz and his wife, Nancy, for $2,700 each. Anschutz, a native of Russell and alum of the University of Kansas, helped found Major League Soccer. Charles Koch, CEO of Koch Industries, gave Moran $2,700. His son, Chase Koch, president of Koch Fertilizer, and Chase’s wife, Anna, also each gave Moran $2,700. Moran’s most recent report also includes contributions from state Rep. Mark Hutton, R-Wichita, who gave $2,700, and Kansas Secretary of Wildlife, Parks and Tourism Robin Jennison, who gave $1,000. Former MHA Nation Tribal Chairman Tex Hall has joined a company focused on producing marijuana on reservations. Native American Organics LLC will help tribes who want to enter the marijuana products industry set up legal growing and distribution systems. The company is a partnership between Hall’s Red Tipped Arrow LLC and Wright Family Organics LLC, a California-based medical marijuana research and operations company. The company will work on regulation and compliance issues with tribes located in states where medical and recreational marijuana is legal, helping to break down barriers to entry. It will help tribes make law governing the industry on their reservations. In December, the U.S. Department of Justice extended marijuana legalization rights to tribal governments and, earlier this month, Washington Gov. Jay Inslee signed a bill allowing agreements with tribes related to marijuana regulation. Hall said revenues for the legal marijuana industry have reached $11 billion and are projected to reach $30 billion in the next four years. “What really made an impact on me was the potential that cannabis has for healing and easing the pain of our people who suffer from PTSD across Indian Country. Not least among those who suffer are our veterans,” Hall said. North Dakota tribes would not be among those eligible for Native American Organics’ services as marijuana use has not been legalized in the state. Though tribes do have the authority to produce on reservations, Standing Rock Sioux Tribal Chairman Dave Archambault has said the tribe would be unable to transport the product off the reservation to sell. The National Labor Relations Act (“NLRA”) was enacted by Congress in 1935. The Act, also known as the Wagner Act after its champion, New York Senator Robert F. Wagner, passed the Senate in May 1935, the House in June 1935, and was signed into law by President Roosevelt on July 5, 1935. The Act’s purpose was to encourage workers’ collective bargaining rights and protect them from retribution for organizing unions. The Act created the National Labor Relations Board (“NLRB”), a new agency, to enforce the new policy. Despite the fact that Congress had enacted sweeping pro-Indian legislation in the form of the Indian Reorganization Act of 1934 in the previous year, the NLRA did not mention Indian tribes at any point. Until 2004, Indian tribes and tribally owned businesses were generally assumed to be beyond the jurisdiction of the labor legislation with few exceptions. In 2004, the NLRB reversed that assumption with a ruling that it had jurisdiction over the San Manuel Casino pursuant to the NLRA. The matter originated from a complaint filed with the NLRB by UNITE HERE!, a large California hotel and restaurant workers’ union, which complained that the Tribe had allowed a competing union, the Communication Workers of America, access to the casino to organize its employees while denying UNITE HERE! representatives access to the site. The Tribe moved to dismiss the proceeding for lack of jurisdiction. The NLRB held that it had jurisdiction, reasoning that (1) the NLRA applies to tribal governments by its terms, despite any express reference to Indian tribes, (2) the legislative history of the NLRA did not suggest a tribal exception, and (3) federal Indian policy did not preclude the application for the NLRA to the commercial activities of tribal governments. The board found an unfair labor practice and ordered the Tribe to allow UNITE HERE! access to the casino workers. The Tribe appealed the ruling to the United States Court of Appeals for the District of Columbia Circuit. UNITE HERE! intervened as a defendant. The Court determined that the question of the NLRA’s application to Indian tribes turned on two related questions: (1) whether application of the NLRA to San Manuel’s casino would violate federal Indian law by impinging upon protected tribal sovereignty, and (2) whether the term “employer” in the NLRA reasonably encompasses Indian tribal governments operating commercial enterprises. In resolving these questions, the D.C. Circuit recognized the tension between the Supreme Court’s 1960 holding in Federal Power Commission v. Tuscarora Indian Nation, that “a general statute in terms applying to all persons includes Indians and their property interests,” and other Supreme Court precedents favoring tribal sovereignty, including the 1978 Santa Clara Pueblo v. Martinez holding that any impairment of tribal sovereignty required a clear expression of Congressional intent in the statutory text. The Court resolved this tension by stating that “if the general law relates only to the extra-governmental activities of the tribe, and in particular activities involving non-Indians, then application of the law might not impinge on tribal sovereignty.” Ultimately, the Court held that the impact of NLRB jurisdiction on the Tribe’s sovereignty was “negligible in this context, as the Tribe’s activity was primarily commercial,” that the Board’s decision as to the scope of the term “employer” in the NLRA was permissible, and affirmed the Board’s jurisdiction over the casino. More recently, in Michigan, the Saginaw Chippewa Indian Tribe has appealed an NLRB ruling that the Tribe violated the NLRA. In October 2014, the NLRB ordered the Saginaw Chippewa Tribe to reinstate an employee allegedly fired for union organizing at the Tribe’s casino. The Tribe appealed to the Sixth Circuit Court of Appeals. If that Court rules that the NLRB lacks jurisdiction over the Tribe, that decision would create a circuit split and likely end up before the United States Supreme Court. 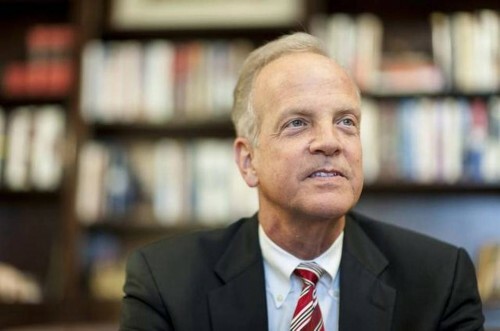 In January, Kansas Republican Senator Jerry Moran introduced S.248, the “Tribal Labor Sovereignty Act of 2015.” The Bill would amend the NLRA to exclude “any enterprise or institution owned and operated by an Indian tribe and located on its Indian lands.” At its February 2015 Executive Council Winter Session, the National Congress of American Indians, the largest Native American policy organization, passed a resolution in support of the bill. A similar bill has been introduced in the House of Representatives. The Senate Indian Affairs Committee will hold a hearing on the bill later this month. (U.S. SENATE)—Senator Jon Tester today reaffirmed his commitment to Indian Country by reintroducing a bipartisan bill that reaffirms the long-standing policy of restoring tribal homelands and allows tribes to determine how to use their own land to create jobs and increase economic development. Tester’s bill amends the Indian Reorganization Act to provide the Interior Department the authority to take land into trust for all tribes – reversing the Supreme Court’s ruling in Carcieri v. Salazar. In 2009, the Supreme Court issued a decision that prevents the Interior Department from taking land into trust for tribes recognized after 1934 – the year the Indian Reorganization Act was enacted. The Supreme Court decision created two classes of tribes, those recognized before and after 1934. This decision has caused major delays and unnecessary costs for tribes in their efforts to put tribal lands into trust. The Carcieri decision has significantly impacted all tribes’ ability to restore tribal land base for economic and infrastructure development by delaying application processing, allowing costly litigation, and creating uncertainty for tribal governments. Tester, vice chairman of the Senate Indian Affairs Committee, first introduced this legislation last Congress. It passed unanimously out of committee. Tester’s bill is cosponsored by Senators Moran (R-Kan.), Franken (D-Minn.), Heinrich (D-N.M), Heitkamp (D-N.D.), Murray (D-Wash.), Stabenow (Mich.), and Udall (D-N.M). Washington, DC- On March 7, 2015, Tribal governments may elect to begin exercising jurisdiction over non-Indians who commit crimes of domestic violence, dating violence, or violate a protection order against a Native victim on tribal lands. “This is a major step forward to protect the safety of Native people, and we thank all Members of Congress for passing the Violence Against Women Act of 2013 and recognizing tribal authority,” said Brian Cladoosby, President of the National Congress of American Indians and Chairman of the Swinomish Tribe. So far three Tribes, the Confederated Tribes of the Umatilla Indian Reservation, the Pascua Yaqui Tribe, and the Tulalip Tribes have been able to exercise jurisdiction over non-Indians under a Pilot Projectsince February 6, 2014. To date the Tribes have charged a total of 26 Special Domestic Violence Criminal Jurisdiction cases. Violence against Native women has reached epidemic proportions. The root cause is a justice system that forced tribal governments to rely on distant federal — and in some cases, state —officials to investigate and prosecute misdemeanor crimes of domestic violence committed by non-Indians against Native women. However, outside law enforcement has proven ineffective in addressing misdemeanor level reservation-based domestic violence. The Justice Department has found that when non-Indian cases of domestic violence go uninvestigated and unpunished, offenders’ violence escalates. The 2013 VAWA Reauthorization authorizes tribal governments to investigate and prosecute all crimes of domestic and dating violence regardless of the race of the offender. Tribes choosing to exercise Special Domestic Violence Criminal Jurisdiction must provide the same rights guaranteed under the Constitution as in state court. This includes the appointment of attorneys for indigent defendants and a jury drawn from the entire reservation community. “Many tribal courts are already providing these protections to defendants, and it isn’t a big step to provide indigent counsel to all. Just like county courts, tribal courts can contract for public defenders on a case-by-case basis,” encouraged President Cladoosby. 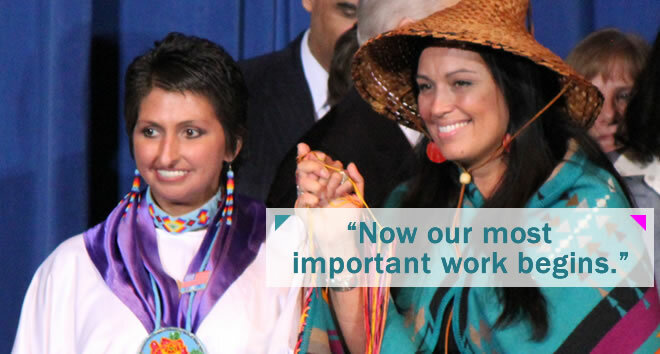 For an overview on tribal VAWA, and more information please see: http://www.ncai.org/tribal-vawa. The Tribal Law & Policy Institute has developed a Legal Code Resource for implementation at www.TLPI.org. The U.S. Department of Energy (DOE) says it will continue to provide assistance to tribal governments to accelerate renewable energy deployment through its Strategic Technical Assistance Response Team (START) program. The DOE’s Office of Indian Energy Policy and Programs and experts from the National Renewable Energy Laboratory will provide technical assistance for tribal clean energy development by supporting community- and commercial-scale renewable energy projects across the country. Since its December 2011 launch, the START Program has helped 21 tribal communities advance their renewable energy technology and infrastructure projects – from solar and wind to biofuels and energy efficiency. START will assist tribal project team and tribal legal/finance specialists with reaching a late-stage development decision point or milestone to further a project toward development. Eligible applicants for this opportunity include Indian tribes, Alaska Native regional corporations and formally organized tribal energy resource development organizations. Applicants designated as White House Climate Action Champions will also benefit from the assistance of the START Program and be given preferential consideration. Applications are due to the DOE’s Office of Indian Energy Policy and Programs by May 1. Up to five projects will be selected by late June 2015. Technical assistance will be provided from July of this year through August 2016, notes the DOE. In addition to this opportunity, the DOE launched the third round of the Alaska START Program in December to assist Alaska Native villages and federally recognized Alaska Native governments with accelerating clean energy projects. Applications are currently being reviewed, and selected projects will be announced in April. A funding system that routes money through a bureaucratic maze with more than a dozen checkpoints before it arrives at its destination – tribal governments – is one of the obstacles Indian country faces in its quest for self-governance, the head of the Bureau of Indian Affairs said at the National Congress of American Indians annual meeting. “Rube Goldberghimself couldn’t have come out with a more complicated system!” Assistant Secretary – Indian Affairs Kevin K. Washburn said, showing the amused audience a mind-boggling, arrow-marked illustration of how the funds flow. Washburn spoke to a full crowd packed into the General Assembly hall at the Hyatt Regency in Atlanta where the NCAI held its 71stannual Convention & Marketplace October 26-31. Washburn was among dozens of dignitaries – tribal leaders and federal government officials, including Interior Department Secretary Sally Jewell – who spoke at the convention. The convention’s theme prompted him to review what’s been done so far under the Obama administration to advance tribal governance and what remains to be done. “We’re coming up on the fourth quarter,” Washburn said, referring to the last two years of the Obama administration that will end in 2016. “And it hasn’t been all victories, we’ve had some setbacks.” The top setback has been the failure so far to fix the Supreme Court’s devastating ruling in Carcieri v Salazar,which has hampered efforts to take land into trust for tribes. “But what I’d like to do in the fourth quarter is really run up the score. We have to join together and work together to do that and NCAI is our best partner in doing that because it’s our best way of getting to tribes,” Washburn said. Among recent victories Washburn cited the Violence Against Women Act, the Tribal Law and Order Actand the HEARTH Act. But in terms of moving tribal self-governance forward for the next generation, “we’ve got a lot of challenges,” Washburn said. Many of them have to do with how programs are funded. Several laws enacted over the years to encourage and improve tribal self-governance – the 1975 Indian Self Determination and Education Assistance Act; the 1988 tribal schools act; the Self-Government Demonstration Project Act, the Indian Employment, Training and Related Services Demonstration Act of 1992and others – have different funding requirements. And then there’s the money flow chart, which came to light when Washburn started asking why it took so long to get contract support funding out to the tribes. Washburn took ownership of the problem – “This is all on me,” he said – and informed the NCAI assembly that he is working with Deputy Assistant Secretary for Management Tommy Thompson to fix the problem. “We have got to get the money out to tribes quickly so that tribes can use that money when it’s needed. We’re trying!” he said. The audience gave him a standing round of applause. WASHINGTON – Building off of sustained momentum from the U.S. Department of the Interior’s Land Buy-Back Program for Tribal Nations (Buy-Back Program), Deputy Secretary Mike Connor today announced that purchase offers worth more than $63.5 million have been sent to nearly 2,800 landowners with fractional interests on the Lake Traverse Indian Reservation in South Dakota (homeland of the Sisseton Wahpeton Oyate). Interested sellers will have until November 24, 2014, to return accepted offers. The tribe will host an outreach event on Wednesday, October 15 at the Tribal Elderly Center in Agency Village, S.D. The all-day event will feature speakers from the Buy-Back Program and staff available to help landowners with questions about their offer packages. Landowners can contact the tribe’s staff at: 605-698-8296 or 605-698-8203. As part of President Obama’s pledge to help strengthen Native American communities, the Buy-Back Program has successfully concluded transactions worth more than $146.4 million and has restored the equivalent of more than 280,000 acres of land to tribal governments. The Buy-Back Program implements the land consolidation component of the Cobell Settlement, which provided $1.9 billion to purchase fractional interests in trust or restricted land from willing sellers at fair market value within a 10-year period. Individuals who choose to sell their interests receive payments directly into their Individual Indian Money (IIM) accounts. In addition to receiving fair market value for their land based on objective appraisals, sellers also receive a base payment of $75 per offer, regardless of the value of the land. Consolidated interests are immediately restored to tribal trust ownership for uses benefiting the reservation community and tribal members. For example, the Oglala Sioux Tribe of the Pine Ridge Reservation recently announced that the tribe is embarking on a $9 million housing program, aided by the recent acquisition of land through the Buy-Back Program. Sales of land interests will also result in up to $60 million in contributions to the Cobell Education Scholarship Fund. This contribution is in addition to the amounts paid to individual sellers, so it will not reduce the amount landowners receive for their interests. There are almost 245,000 owners of nearly three million fractional interests, spanning 150 Indian reservations, who are eligible to participate in the Buy-Back Program. Many see little or no economic benefit from what are often very small, undivided interests in lands that cannot be utilized due to their highly fractionated state. Offers are currently pending at a number of additional locations with deadlines approaching soon, including the Northern Cheyenne (Oct. 17), Flathead (Oct. 24), Umatilla (Oct. 31) and Crow (Nov. 21) Indian Reservations. Landowners can contact the Trust Beneficiary Call Center at 888-678-6836 with questions about their purchase offers. Individuals can also visit their local Office of the Special Trustee for American Indians (OST) or Bureau of Indian Affairs (BIA) office, or find more information at www.doi.gov/buybackprogram/landowners in order to make informed decisions about their land. Individual participation is voluntary. A decision to sell land for restoration to tribes does not impact a landowner’s eligibility to receive individual settlement payments from the Cobell Settlement, which are being handled by the Garden City Group. Inquiries regarding Settlement payments should be directed to 800-961-6109. Navajo Nation President Ben Shelly (L) puts a blanket on the shoulders of U.S. 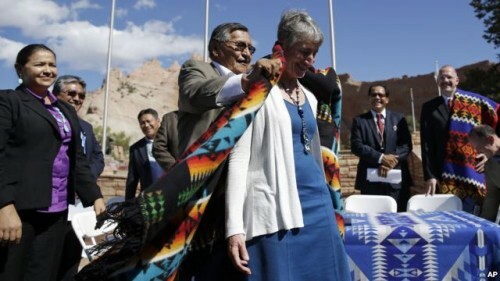 Interior Secretary Sally Jewell after a ceremonial signing of a record multi-million-dollar settlement, in Window Rock, Arizona, at the Navajo Nation, Sept. 26, 2014. WASHINGTON—A record multi-million-dollar settlement between the United States government and the Navajo Nation has been seen as a turning point in relations between the Federal government and the entire Indian nation. It is the largest sum ever paid by the U.S. government to a single Indian tribe.Within the territory of the United States are 562 nations — ethnically-, culturally- and linguistically-diverse Native American tribes recognized by the United States as sovereign governments. The largest is the Navajo Nation, whose territory stretches more than 70,000 square kilometers across three western states.While the tribal governments enforce laws on their territory and license and regulate activities, the federal government holds the vast majority of Indian lands, money and resources in trust for the tribes, and is required to manage them in a way that benefits the tribes and individual Native Americans. The Navajo Nation sued the federal government in 2006 and sought $900 million in damages for mismanagement of resources and trust accounts since at least 1946. The claims in the case involved essentially three things: one, the Federal government as trustee was responsible for negotiating a contract for the extraction of natural resources for the Navajo Nation’s property; two, the government was responsible for monitoring the performance under the contract to make sure that the Navajo Nation was paid the royalties due; and three, as trustee the United States was obligated to invest the proceeds in a commercially appropriate way. Andrew Sandler, who represented the Navajo Nation in the suit, said the settlement for $554 million is an equitable deal for both parties. It comes at a time when the Navajo Nation needs significant investment in several areas — from education to housing — and he said it will go a long way toward addressing those needs. The signing ceremony took place late last month in Window Rock, Arizona, which serves as the capital of the Navajo Nation. Navajo official Rick Abasta told VOA that there were compromises on both sides. “There was a little bit of compromise on the Nation’s part in accepting this $554 million settlement. But I think the bigger picture was to end the litigation against the federal government, because of course that has a cost as well, and move forward with improving the Nation and utilizing these funds,” he said. In various public statements, U.S. officials had acknowledged that the Federal government had failed in its obligation as trustee. However, the deal reflects Washington’s commitment to upholding its trust responsibility to Indian Country and to building strong, prosperous and resilient tribal communities. Navajo Nation President Ben Shelly said the agreement was symbolic of the evolving relationship between the Navajo Nation and the U.S. government. U.S. tribes have filed more than 100 lawsuits against the federal government. Since early 2012, the government has resolved about 80 of them, amounting to $2.5 billion.